Thackeray starring Nawazuddin Siddiqui, Amrita Rao & Abdul Quadir Amin had got approx 1500+ screens across India. 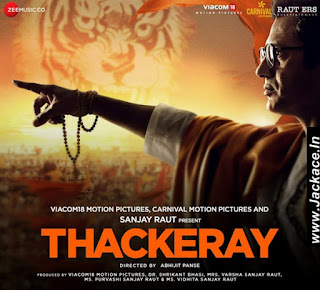 Abhijit Panse's Directional venture biographical propaganda film, based on the life of Bal Keshav Thackeray also known as Balasaheb Thackeray, Thackeray is a small budget movie. Thackeray Should cross approx 40.00 Crore nett all over the India to be called a hit and The Film should do approx 30.00 Crore business to recover the investment only. No Comment to " Thackeray Budget, Screens & Box Office Collection India, Overseas, WorldWide "